The Internet of Things, also known as IoT technology, is changing life as we know it. Consumers are discovering that these tech advancements are making life that much easier in all sorts of ways. 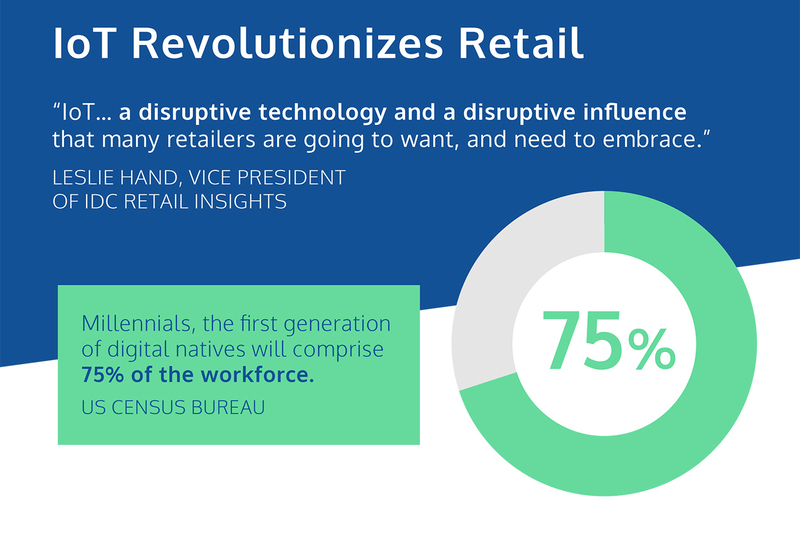 Technology has disrupted the retail sector more than just about any other segment of the economy. The Internet of Things (IoT) is fueling the growth of smart retail solutions, connecting customers with valuable information while they shop. Add in the fact that consumer behaviors have changed quite dramatically in the past decade and it is easy to understand why most retailers are reeling. Some have wondered whether the dominance of online shopping will prove to be the final nail in the coffin for traditional stores. IoT in retail has not yet reached a mainstream tipping point, yet that day is not far away. IoT just might be what traditional brick-and-mortar stores need to combat the ever-growing online businesses that win more and more market share with each passing day. Specifically, the customer experience is being greatly improved with IoT. It might not be long until the entire shopping experience is driven by IoT. Those who own and manage traditional stores are now learning that IoT in retail just might be the solution to their woes. According to Forbes, 70 percent of retail decision makers are preparing to implement IoT to enhance the customer experience. A whopping 90 percent of retailers will provide the option to buy online and pick up in the store within the next three years. Adding to that, nearly 75 percent of all retailers have determined that managing big data is important to business-critical operations. Retailers of the future will use mobile point-of-sale computers, so credit and debit payments can be scanned and accepted in any part of the store. Forbes reports nearly 90 percent of retailers will have such devices deployed by 2021. More than two-thirds of businesses also have planned significant investments in machine learning and cognitive computing over the next three years. The challenge is maximizing the utility of these complex breakthrough technologies to enhance the customer’s experience in real-time. Automation will soon be used to manage and track inventory with incredible efficiency, as well as offer a more responsive customer experience. It will not be long until sensors are on just about every single retail shelf. Retailers will soon be able to identify specific customers in their store to customize offerings. Forbes estimates 3 out of 4 retailers will have such identification capabilities by 2021. Retail shopping is becoming easier with each passing day. Yet, it is not only the fluidity of this experience that is improving. Retail shopping is becoming increasingly personalized, thanks to the rise of IoT! Personalizing the retail experience will provide the customer with the most efficient and informative shopping experience possible. Associates armed with mobile point-of-sale tech will soon be able to execute transactions at any location in the store instead of having customers stand in line at the cash register. No customer wants to wait in line. Thanks to smart retail solutions, it might not be long until the dream of a seamless shopping and checkout experience is possible. Tech improvements that allow for the rapid transmission of useful information help customers, as well as retailers. From the retailer’s perspective, data collection is useful because it provides insights into consumer behavior. As previously mentioned, beacons and point of sale (POS) systems empower retailers to learn more about customers and fully personalize the shopping experience. Personalization through product recommendations and other custom-tailored messages will inspire customers to spend more money at brick-and-mortar stores rather than shop on the web. Another emerging technology in retail is the use of beacons. In-store beacons are particularly important for the progression of retail shopping because retailers can determine where mobile app users are located in the store at all times. This information is then used to provide shoppers with personalized content, discounts and other helpful information. Imagine a future in which your smartphone app receives a signal from a beacon that provides consistent communication throughout the shopping experience. This is exactly what is necessary to encourage customer purchases in brick-and-mortar stores rather than visiting the store and buying online. Beacon technology has emerged as quite important for retail marketing. Beacons function with Bluetooth to send signals to mobile devices. These nifty smart retail solutions will soon take the industry to the next level in terms of customer engagement, advertising and profitability. Beacons will soon be ubiquitous in stores across the United States and beyond. Beacons are quickly gaining steam at businesses across the world as they connect retailers to customers in a mutually beneficial arrangement. Consider that a study conducted a couple of years ago by Swirl shows nearly three-quarters of all shoppers provided with beacon content through their smartphone stated it increased their chances of making a purchase while perusing the store’s offerings More than 60 percent of people said they were willing to spend more on holiday shopping at traditional brick-and-mortar stores if those stores sent offers and other content during the shopping experience. The same percentage of respondents indicated they would visit a store more frequently if targeted through beacon marketing. The smart retail solutions statistics noted above are quite revealing. Customers targeted with proximity marketing are more inclined to spend money or, at least, consider spending money at traditional brick-and-mortar businesses. In addition, it is not only sales that are positively impacted by proximity marketing; this form of marketing also improves brand affinity and the full customer experience. IoT beacons are undoubtedly the wave of the future as they allow for marketing based on consumer location and habits through the strategic use of beacons, cross-channel analytics, and sensors. Fully customized promotions and messages for each unique customer are transmitted to his or her phone, a wearable device, as well as digital signs within stores. IoT devices can even determine where customers spend time within the store, the areas of the store they tend to frequent and so on. These tech advances mean the shopping experience will only become that much more personalized as time progresses, as well as build customer loyalty. IoT smart retail solutions are poised to dramatically alter retail as we know it. One need not look any further than Amazon’s Go store recently launched in Seattle to see how IoT is changing retail shopping. This futuristic store represents the synthesis of cutting-edge technology with traditional brick-and-mortar shopping for an improved customer experience and increased corporate profits. Amazon Go is a sneak preview of tomorrow’s retail stores. This high-tech store empowers shoppers to select the items they desire, scan the Amazon Go app and exit the store without forking over cash, a credit card, debit card or another form of payment. Everything, including payment, is done through IoT. Human interaction in the context of retail is quickly being phased out for the sake of efficiency, both to reduce overhead expenses and speed up the shopping experience. IoT might seem a bit invasive to privacy advocates. Yet the overarching purpose of this technology is to personalize the shopping experience, bolster brand awareness and ultimately provide consumers with the products they need and desire at competitive prices. As an example, the popular retailer L.L. Bean is placing sensors in its boots and coats to gather and analyze data with the blockchain technology made famous by cryptocurrencies such as bitcoin. The collected data is reviewed to glean valuable insights into the frequency of use and washings and even temperature information. With the rise of smart retail solutions powered by IoT, the idea of a personalized, convenient, flexible, and more hands-on shopping experience is not so far-fetched anymore. IoT is changing the way industries work, and with smart applications focused on retail, more benefits will surely be felt not only by the consumers but the companies themselves.